The Maplin Electronic Circuits Handbook provides pertinent data, formula, explanation, practical guidance, theory and practical guidance in the design, testing, and construction of electronic circuits. 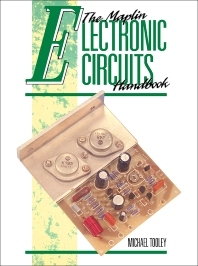 This book discusses the developments in electronics technology techniques. Organized into 11 chapters, this book begins with an overview of the common types of passive component. This text then provides the reader with sufficient information to make a correct selection of passive components for use in the circuits. Other chapters consider the various types of the most commonly used semiconductor devices. This book discusses as well the correct operation of the power supply, which is crucial to most electronic circuits. The final chapter deals with the final Maplin project, Gavin Cheeseman's DigiDice, which makes use of digital rather than analog methods and neatly shows how electronics can be put to use in a novel yet familiar application. This book is a valuable resource for electronic engineers, students and electronics enthusiasts.